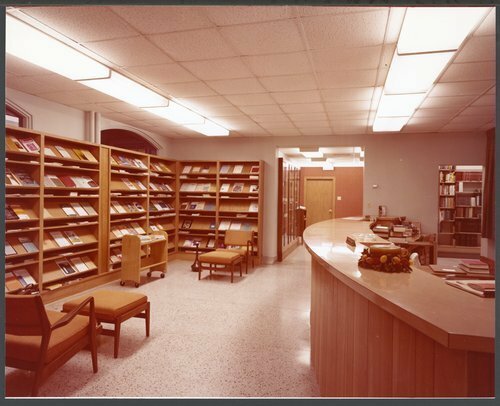 These photographs show the Professional Library as it was before it was computerized. Dr. C.F. Menninger and his sons, Dr. Karl and Dr. Will, founded the Menninger Clinic for mental-health treatment, education, research, and prevention in Topeka in 1919. The Library was originally established with their own professional books and journal subscriptions. Menninger Clinic Professional Library, Topeka, Kansas - The circulation desk and journal browsing area.